Remote storage delivers a cost effective solution for data storage. If data is of a sensitive nature, it should be encrypted prior to outsourcing to ensure confidentiality; however, searching then becomes challenging. Searchable encryption is a well-studied solution to this problem. Many schemes only consider the scenario where users can search over the entirety of the encrypted data. In practice, sensitive data is likely to be classified according to an access control policy and different users should have different access rights. It is unlikely that all users have unrestricted access to the entire data set. 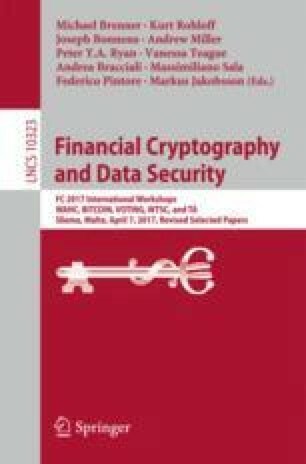 Current schemes that consider multi-level access to searchable encryption are predominantly based on asymmetric primitives. We investigate symmetric solutions to multi-level access in searchable encryption where users have different access privileges to portions of the encrypted data and are not permitted to search over, or learn information about, data for which they are not authorised. J. Alderman—Supported by the European Commission under project H2020-644024 “CLARUS” and acknowledges support from BAE Systems Advanced Technology Centre. S.L. Renwick—Supported by Thales UK and EPSRC under a CASE Award.